I t’s been four years since the last time I went to this zoo. It’s pretty long time ago. But still I can feel the ambiance. Because in the morning when I entered Setail Street, sometime I heard the roaring lions, bears, shrieking primates, and singing birds. Those voices reached the street. Yes, Surabaya Zoo is located in the center of the Surabaya city. Not less than 3,500 animals from 400 species of mammals, birds and reptiles are housed here, including the rare and endangered ones (e.g. orang utan). The zoo is getting fascinated by its aquarium holding thousands of diverse sea animals and reefs. Don’t forget to mention birds dome and nocturnal animal cages. Surabaya Zoo or Kebun Binatang Surabaya is the largest zoo in South East Asia. It was formally opened on August 31st, 1916 by a group of animal lovers. Since then, people of Surabaya don’t need to go to Papuato see the bird of paradise. There are also komodo dragon, jalak (a parrot from Bali), anoa from Sulawesi, bekantan monkey from Borneo, peacock from Ponorogo (East Java), tigers from Sumatra, etc. It’s not only endemic fauna of Indonesia, but also from other continents. What else? Mm, elephant/camel ride, lost ‘n found, restaurants, cafe, ice cream parlor, soft drinks and snacks stands, children playground, and yes, first aid care, also insurance for accidents (just in case). Forget about dispute between the managers, recently. 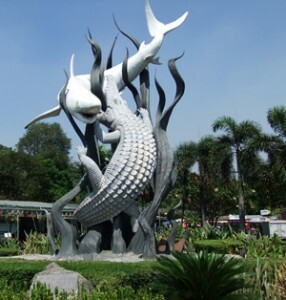 Surabaya Zoo is a great place for recreation. When you look, through for instance Google Earth, Surabaya Zoo is a broad green area. So it is quiet shady here. There are some skyscraper trees. No wonder some say that Surabaya Zoo is the lungs of the city. Pernah sekali kesana, tahun 2002. Hari minggu, pas rame – ramenya, jiaaah! Jadi gak enjoy jalannya. Waktu itu aku ama pacar & temen. Saran buat yang mau kesini, kalo dateng ke KBS jangan minggu atau hari libur, he he..
Msh sama, Aleena. Tiap Minggu dan tgl merah selalu sesak. Kebanyakan orang2 dari kota lain. Kalau terpaksa ke sini sewaktu peak season, ya mestinya berangkat pagi. Sehingga begitu loketnya dibuka jam 7, udah di sana.